After the War was over, President Wilson of the US met with France (Clemenceau) and Great Britain (Lloyd-George) to discuss how they wanted to deal with Germany. At this meeting, each man had their own ideas because they had their individual motives. 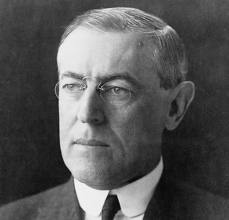 Wilson brought with him The 14 points, so there would be no wars like this one ever again. Wilson also wanted Germany to become a democracy and other countries in Europe to have their own independence and be able to govern themselves.